Mere hours in front of the winter storm that we have been warned is set to pummel the city, I am making my escape into an area being hit by a storm of a different nature. Instead of 20-25 cm of snow, I will be helping the OFKAR shovel the detritus of the past eight months out of her residence room and into either a storage locker or a suitcase. I can foresee it requiring a great deal of tactical manoeuvering, which, if we are being honest here, actually rather warms the cockles of my warm-mongering Teutonic heart. I am sure my insistence on a strategic and orderly approach will drive the OKFAR absolutely bonkers though. We have polar opposite approaches to things such as storage and packing. It will be a rather whirlwind trip, with time for only one quick meal with a couple of friends, but hopefully by Saturday, all that did not fit into the storage locker will find a space in one of those four suitcases instead. Hmmm, rolling or folding? I tend to favour the rolling method myself. 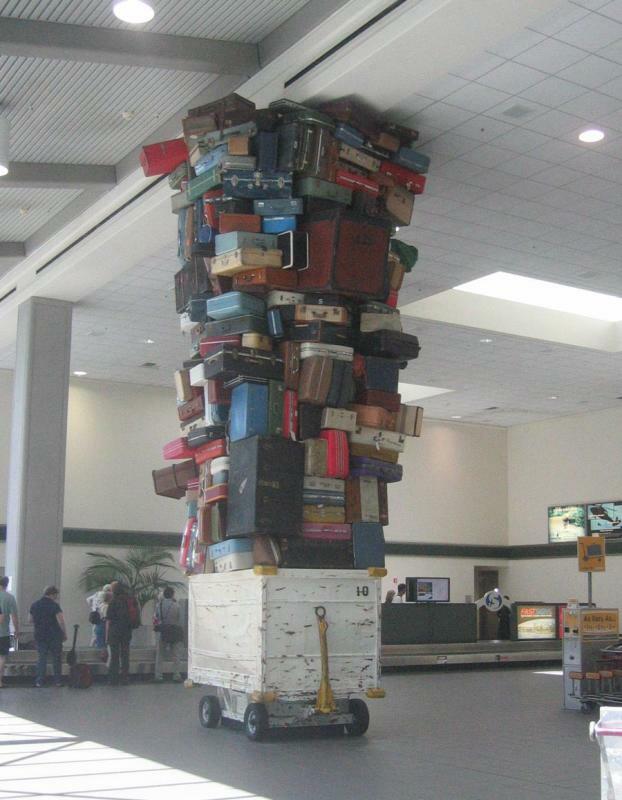 I will try to return with a camera full of images to accompany the stack of suitcases. Stay tuned for the feel-good photos of hilarity and fellowship that will no doubt accompany the resident room de-occupation. To keep you from missing me too much, I invite to read my latest No Depression post about blurring the boundaries between performer and audience. What is the best way to pack a suitcase anyway? I discovered that, at least with pants, if you roll them up like sleeping bags, you can jam a lot more stuff into your suitcase. and they don't get wrinkled. I think that's how military folks pack. I opt for a combination of the roll and fold technique. Like BeckEye, I think pants are good to be rolled but I find sweaters, etc take up too much room with this approach. Then again, last time I packed I was a bit rushed and threw everything in the bag and it still fit, so who knows. The key really is not over packing. I find on a daily basis, I don't really use that much stuff. Well if that's how the military does it, that's good enough for me, Beckeye. I love a man in uniform. The old combination technique, Al, you might be onto something. You should see how little I brought with me on this trip, in anticipation of having a tonne of stuff to bring back. Love the photo: I don't think that's an inordinate amount of crap for a whole eight months. It's isn't the pants that take up room, ladies, and you know it. It's the shoes. Try rolling rolling those up. The strange thing is I was to blame for a lot of the excess, . There was loads of stuff that I insisted she bring with her and was never used. Not next year!